My kids are Boy Scouts, which means they spend a lot of time in a tent. There are many ways to prepare food on a campout, and they do eat a lot of cold cuts and potato chips. But, they've also become masters at Dutch Oven cooking. I was surprised at just how many options you have with just a Dutch Oven and a fire. 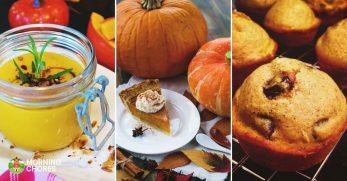 If you love waking up to the crisp air in the mountains or forest, it's time to invest in a Dutch Oven. You can find them at camping supply stores for pretty reasonable prices. It doesn't take a lot of skill or know-how to operate a Dutch Oven, which makes it the perfect choice for using on a camping trip. 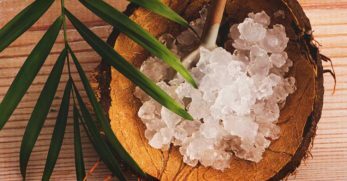 So what are the best benefits of using one? 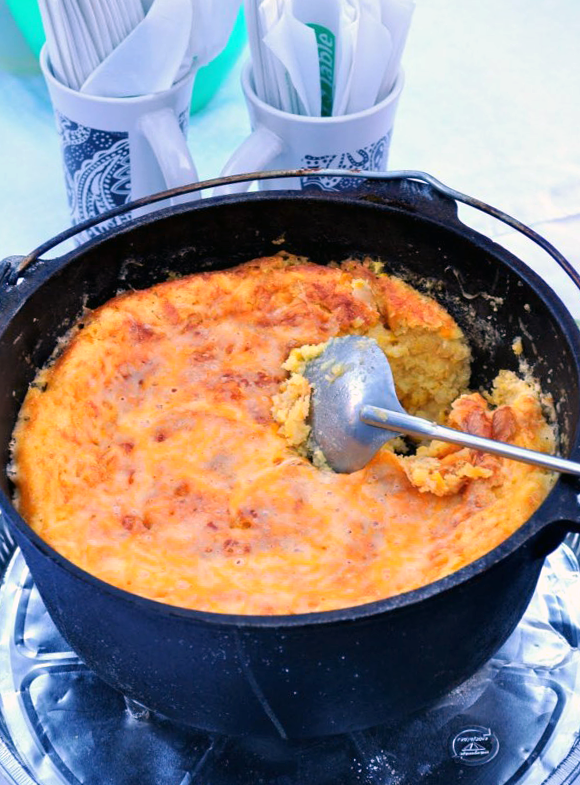 When you're in the great outdoors, Dutch Oven camping recipes can be a real lifesaver. Not only are they easy to make in one pot, but there's not much cleanup to do when you're done cooking. A Dutch Oven will come in handy for all of your outdoor excursions and won't take up a lot of room in your gear kit. 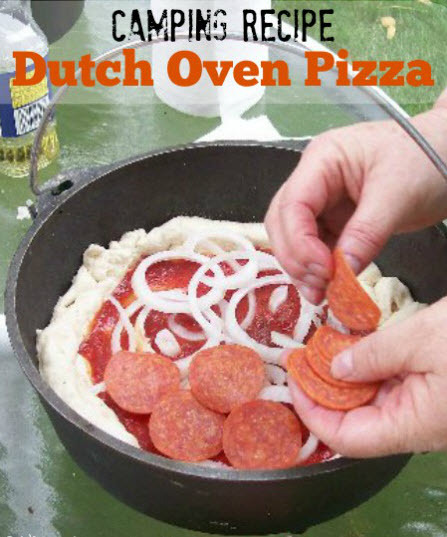 Check out the great Dutch Oven camping recipes here, and you'll see exactly what I mean. 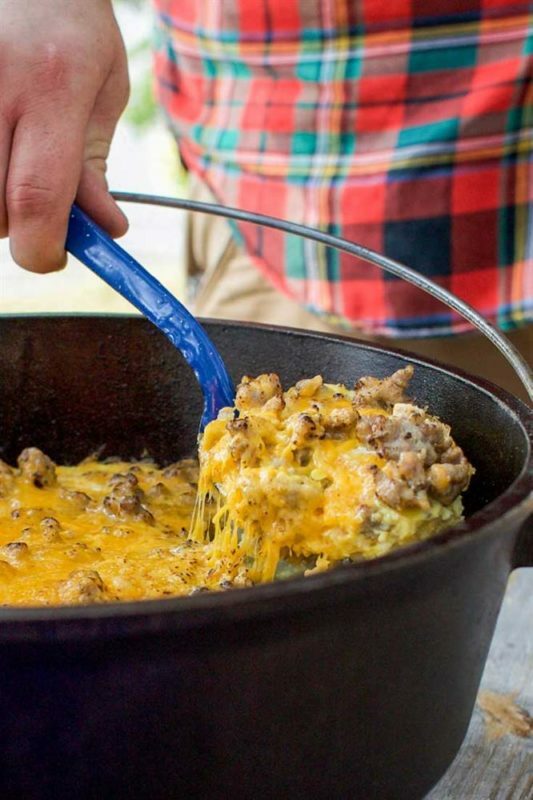 This Mountain Man Breakfast is probably one of the best Dutch Oven camping recipes because it's easy, it's delicious, and it serves a crowd. Who wouldn't want to get up in the morning when there's a big pot of eggs, potatoes, and sausage waiting to be devoured? I like this recipe because it's a one size fits all tastes kind of meal. Put out some salsa, chopped green onions, and other toppings, and everyone can customize to his or her tastes. 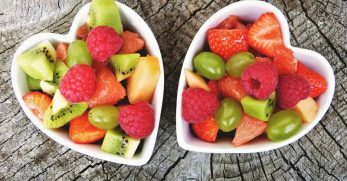 I usually serve this yummy meal with a fruit salad, so it's filling and gets us all ready for a hike. You might not be able to order for delivery, but this Dutch Oven Pizza is the next best thing. I know my kids don't like to think about a vacation without pizza, which is why this easy recipe is so perfect. 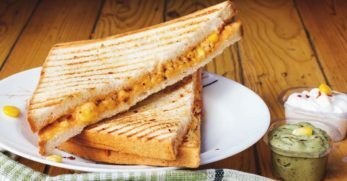 You can make it with everyone's favorite toppings, and the crust gets crisp and golden while the cheese melts most delightfully. 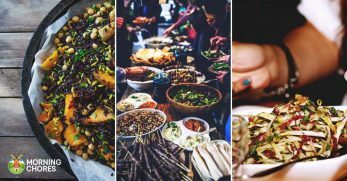 Not only is this meal a crowd pleaser, but it's also super easy to clean up, and if there are leftovers, they can go straight into the cooler to eat cold the following day. Some sliced veggies on the side turn this into a meal you'll want even when you're back at home. 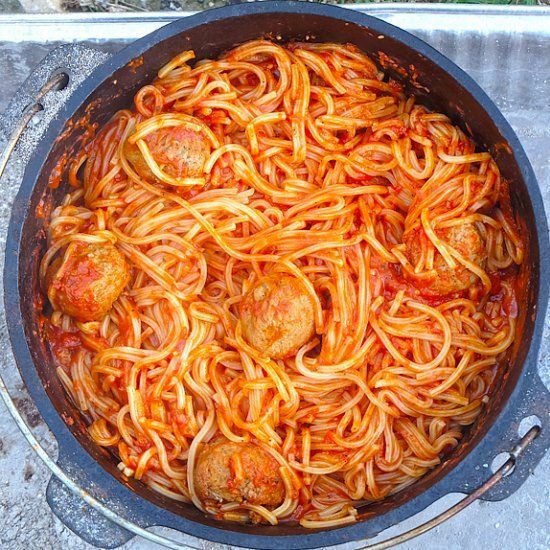 Dutch Oven Spaghetti and Meatballs are sure to become your new thing to eat while you're camping. 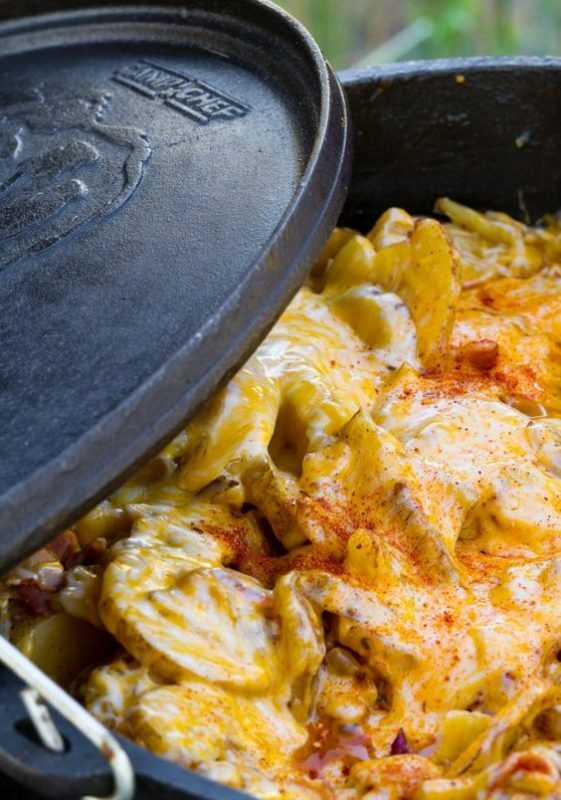 If you've never thought about making pasta over a campfire, you need a Dutch Oven right now. It's effortless to get perfect noodles and coat them with your favorite sauce. Meatballs do the double duty of making this meal super tasty, but also adding protein, which you're going to need if you plan to hike, swim and explore your campsite. Don't forget the Parmesan cheese and crushed red pepper! 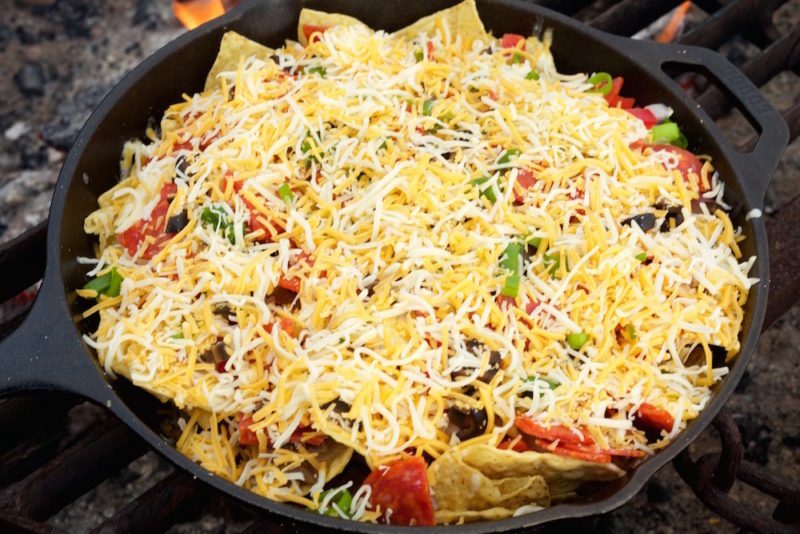 Who says you can't have nachos when you're camping? These Dutch Oven Nachos are so easy to make, and if you love Mexican food as much as I do, you know it's not easy to rough it without for a few days. The great thing about nachos in a Dutch Oven is that the chips stay super crispy, but the cheese gets all gooey and delicious. 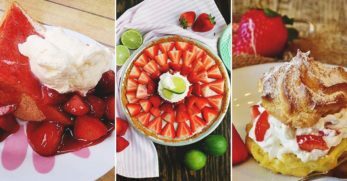 This is another customizable recipe that lets you choose the toppings that everyone loves. 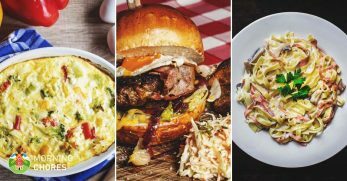 Use the ones in the recipe or mix and match your favorites to create a meal everyone will be talking about. You really can't go wrong with nachos, I promise! 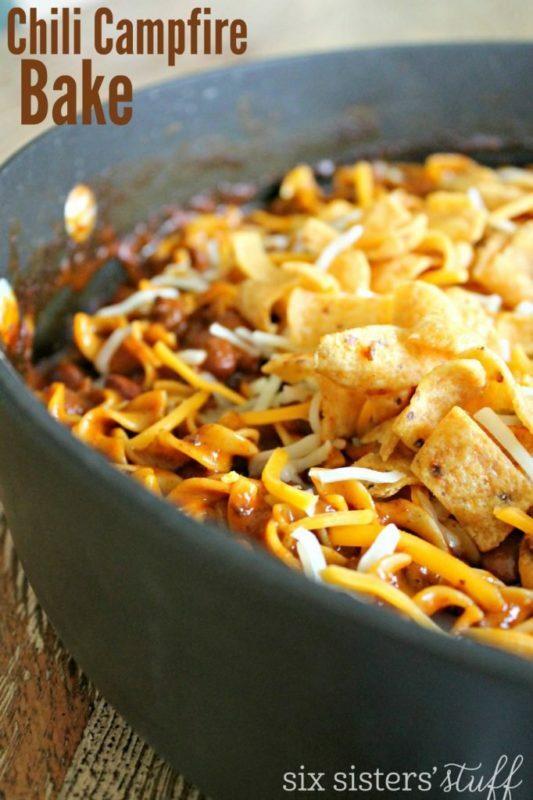 It's not camping until you've enjoyed a big pot of Cheesy Chili, am I right? This easy baked version is so easy. Just toss all the ingredients in the pot and let them meld. When they're steaming and you know it's ready to serve, top the whole thing with cheese and corn chips. Other tasty toppings to offer include sour cream, diced onions, salsa, and tomatoes. The pasta in the pot makes it filling, and that's super important when you're busy camping and everything that goes with it. Anytime I hit the campsite; this meal always shows up on the menu. This Pot Roast is one of the most delicious Dutch oven camping recipes you're ever going to find. And I can say that because I've made it so many times. 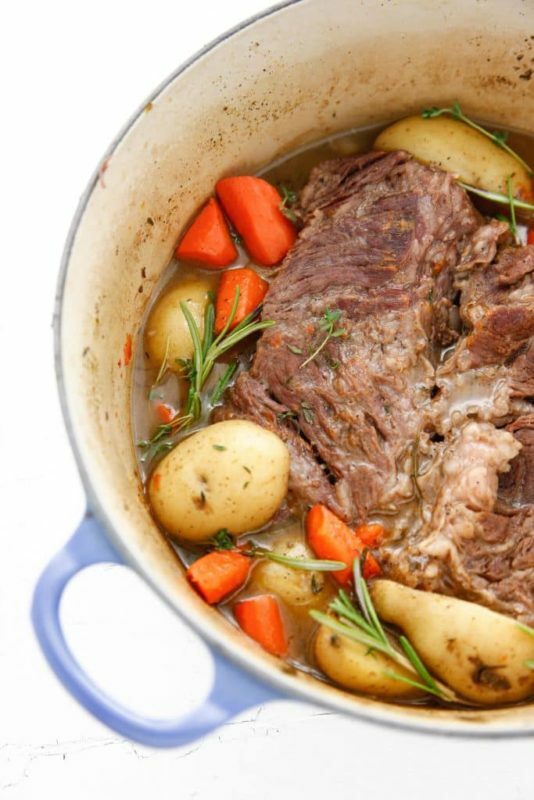 My family loves a good pot roast with potatoes and carrots, and at home, I prepare it in my slow cooker. Since I can't do that at the campsite, imagine our delight when we found this recipe. The meat gets juicy, and the potatoes and carrots are soft and easy to mash. I like to put a little bit of butter on the vegetables. And the best thing? The entire meal can be made in one pot. 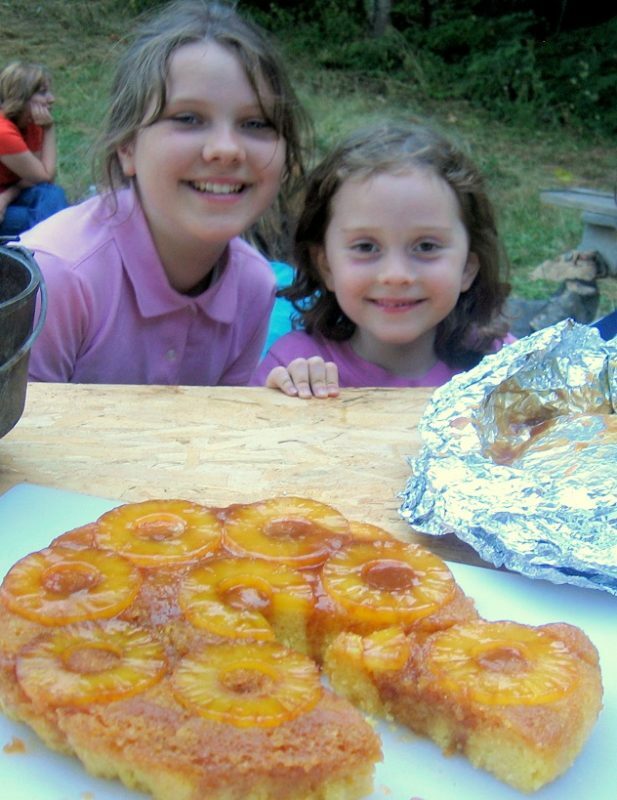 This Pineapple Upside Down Cake tastes excellent straight out of the Dutch Oven, which surprised me a little. I was afraid it would be too crunchy on the bottom. But it wasn't. It came out fluffy and moist and had tons of flavor. 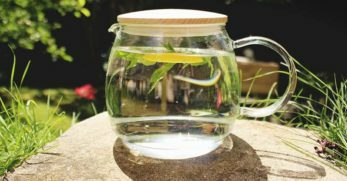 Camping is a special treat, and that's why I like to bring along some things my kids don't get to eat all the time. The tricky thing here is that this cake has pineapple, so it's slightly healthy and gets some fruit into everyone's body in a yummy way. 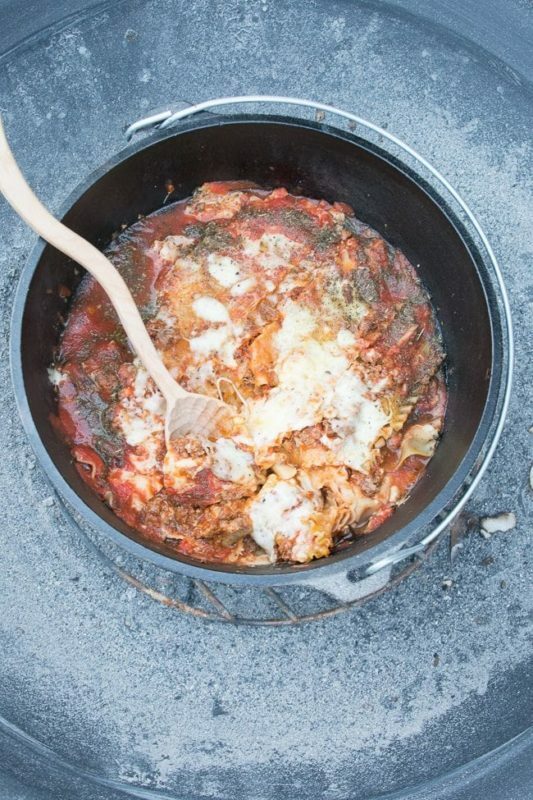 This is one of my favorite Dutch Oven camping recipes because Cheesy Lasagna makes everyone happy. My family asks for lasagna at least once a week and going camping doesn't change that. If you're wondering whether the noodles get all crunchy, wonder no more. Because they don't. A heaping plate of this Dutch Oven lasagna is perfect with a tossed salad and a chunk of garlic bread, which you can prepare before you leave and cook on the fire wrapped in foil. Who said anything about roughing it? These delicious Dutch Oven Potatoes are the perfect thing to serve with hamburgers and hot dogs. And since I have such an affinity for potatoes, it's always been one of my favorites. And what makes potatoes just a little bit better? 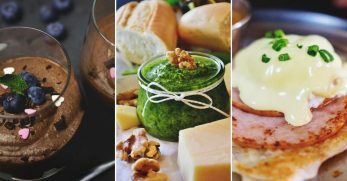 Why a heap of melted cheese, of course. Here's what else is so delightful about these potatoes. 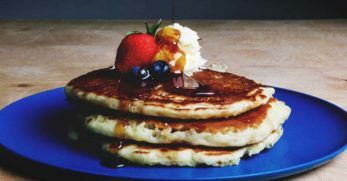 You can whip them up in the morning and serve them with an egg. Then you can reheat them at lunch and dinner. And I love a meal I can cook once and eat several times. Sprinkle some sliced green onions on top for a nice bit of crunch and spice. No one is going to be able to stop eating these mouthwatering Cheesy Garlic Bites. Especially if you are serving the lasagna or chili mentioned above. The dough is super easy to make, and you can sit back and enjoy your family while they bake. To eat, all you have to do is reach in and grab a chunk and tear it off. My family has been known to whip this up and sit around eating it for a snack. Dipped in marinara sauce, it's just about the perfect thing. 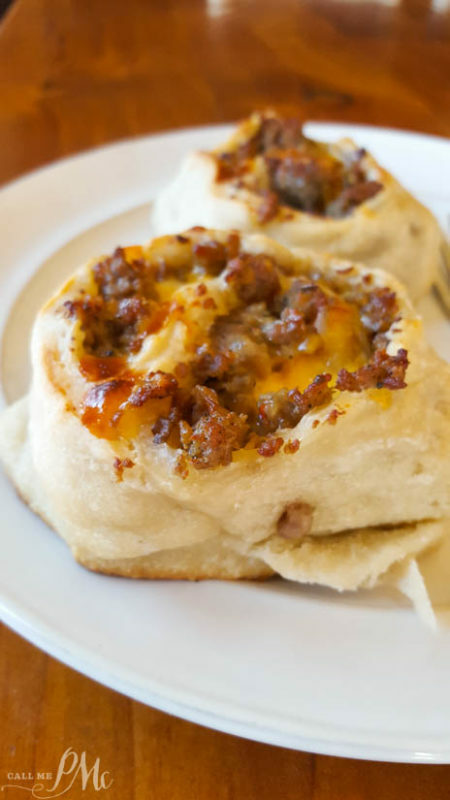 These delicious Breakfast Sausage Pinwheels are lovely served with a side of fruit and are already one of my favorite camping recipes. 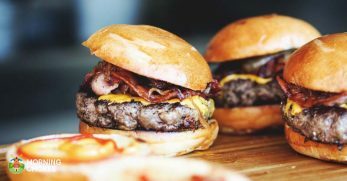 You've got everything in one bite, and it's portable, so you don't even have to sit down to eat it. What could be better than that? I love these because they're super filling and sometimes keep my kids from asking for a snack for at least a half an hour. And I guarantee that everyone is going to be asking for seconds just because there's cheese in there. 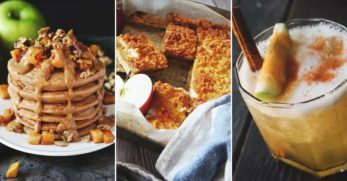 You can even modify these to be gluten-free by using gluten-free biscuits. 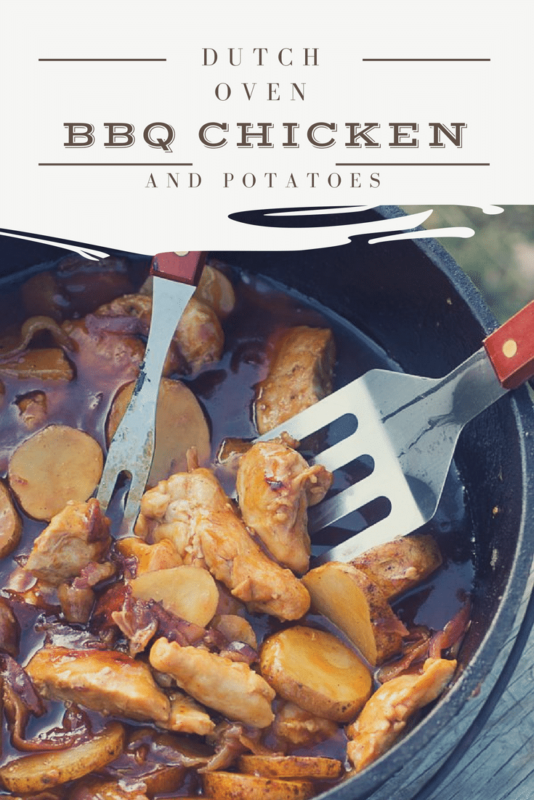 Barbecue Chicken and Potatoes cooked over a fire taste out of this world. There's just something about that flavor imparted when you eat a meal in the great outdoors. And chicken and potatoes are easy to transport to the campsite, and once cooked, can be leftovers the next day. I think one of the reasons this dish is so tasty is because of the sauce. It coats everything, so there's a burst of deliciousness in every bite. 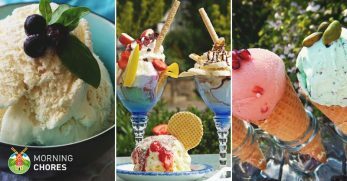 Ready for a sweet ending to your meal? 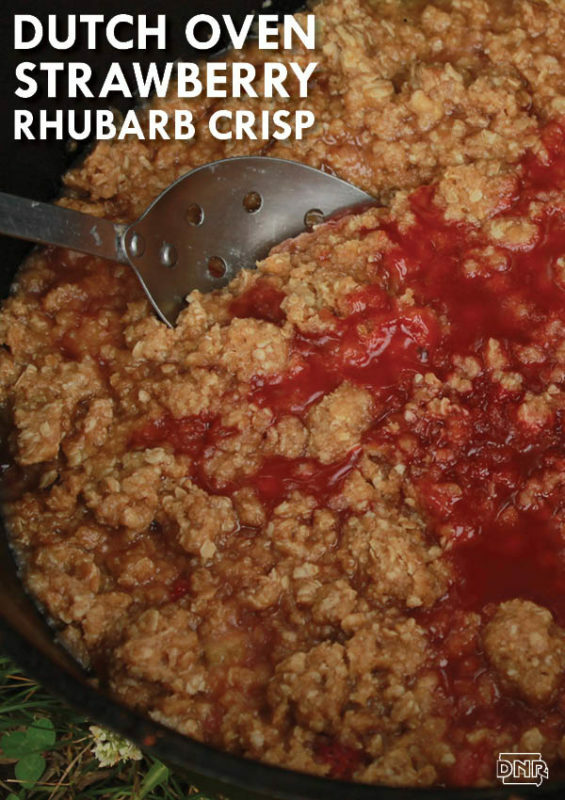 This Strawberry Rhubarb Crisp is just what you've been looking for. At least it's exactly what I've been looking for. I think you'll agree that the runny filling is just right with the crunchy topping. This is easy to make too, but tastes like a pro did it. If you camp in a trailer and have a freezer, nothing tastes better on top of this crips than a scoop of vanilla ice cream. If not, it's also tasty with a spoonful of Greek yogurt. Sounds like breakfast to me! 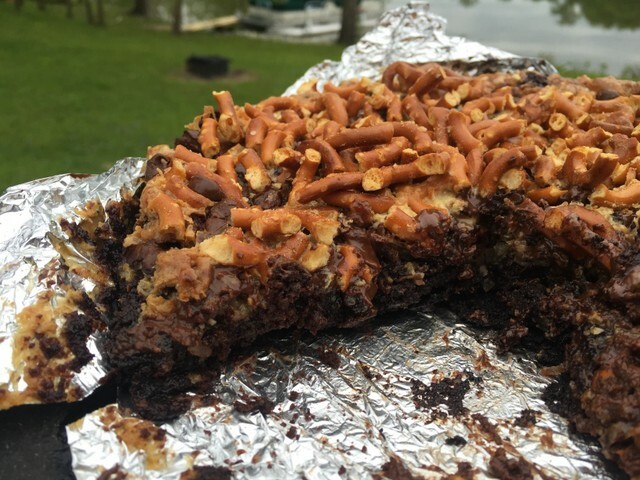 When you break out these Layered Brownies, you'll be everyone's favorite camping buddy. And isn't that your goal? Brownies can be made before you leave and carried with you, but there's just something about a fresh, warm brownie that makes any day that much better. These brownies are super special because they have other layers of flavor. Those pretzels on top take things to a whole new level. 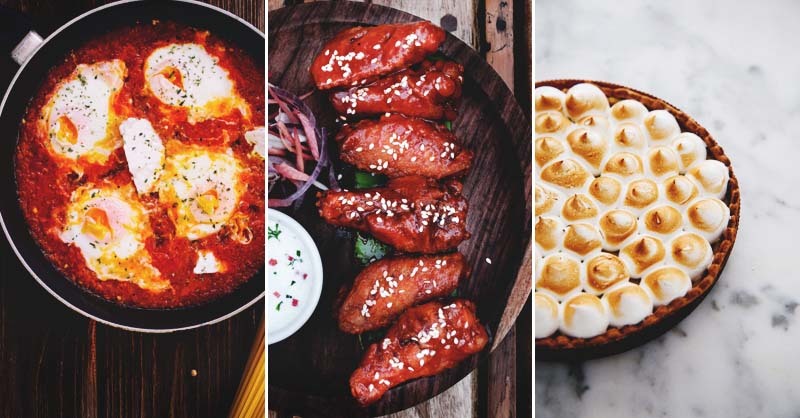 You won't be sorry when you make these. I want some right now! 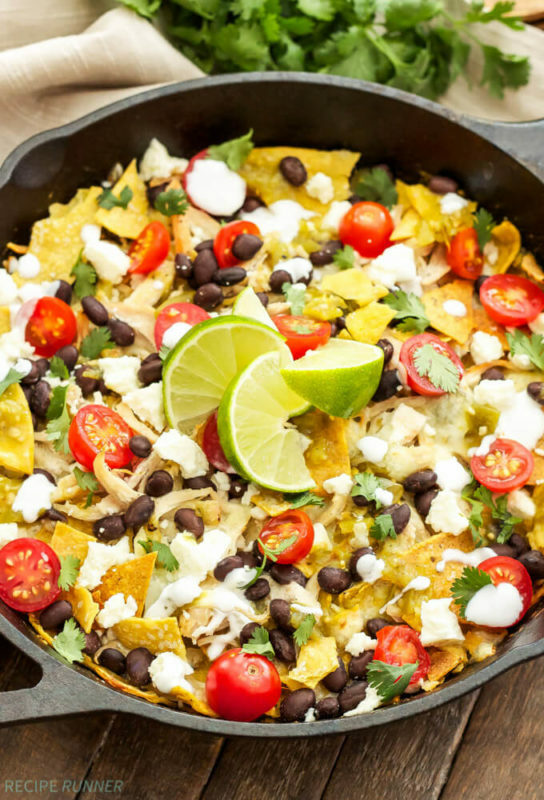 These delicious Chicken Chilaquiles are delicious at breakfast, lunch or dinner. Serve them with an egg on top. That's what I do! 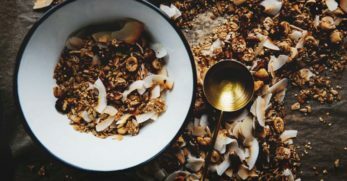 I have to tell you, these are one of my favorite camping recipes and are worth sleeping on the ground in a tent. You can also add some lettuce, avocado or diced jalapeno to the dish for flavor and heat. These are easy to make, and you can store the leftovers and eat them tomorrow. If your family doesn't love them so much, they gobble them all up as my family does. 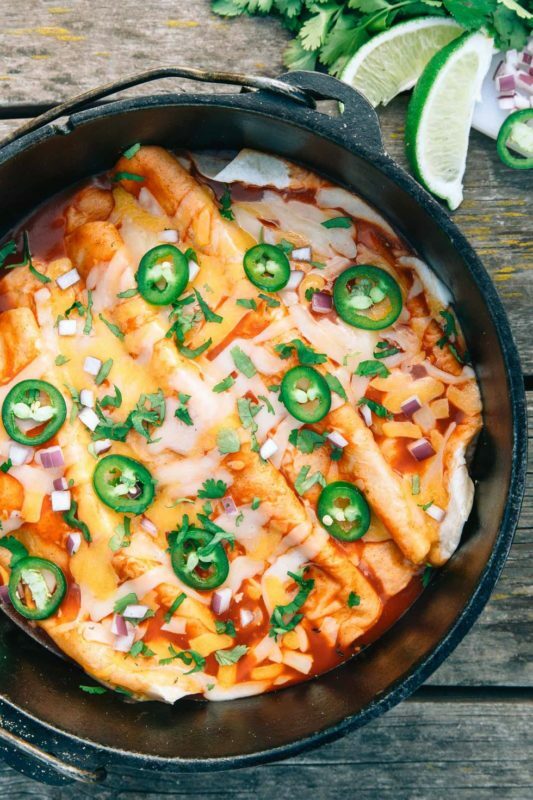 These Dutch Oven Enchiladas have a delightful spicy flavor that makes camping something to love. Enchiladas are another favorite of my family, so I was excited to find out they turn out well in a Dutch Oven. No soggy tortillas or tasteless meat here. The recipe calls for red enchilada sauce, but they taste just as good topped with green chile. Other topping options include lettuce, tomato, sour cream or guacamole. Open a can of beans, and you have a tasty meal. You'll get nothing but smiles when you serve this Old-fashioned Goulash to the people around your campfire. Noodles and ground beef are camping staples simply because they travel well and are easy to customize for a variety of meals. 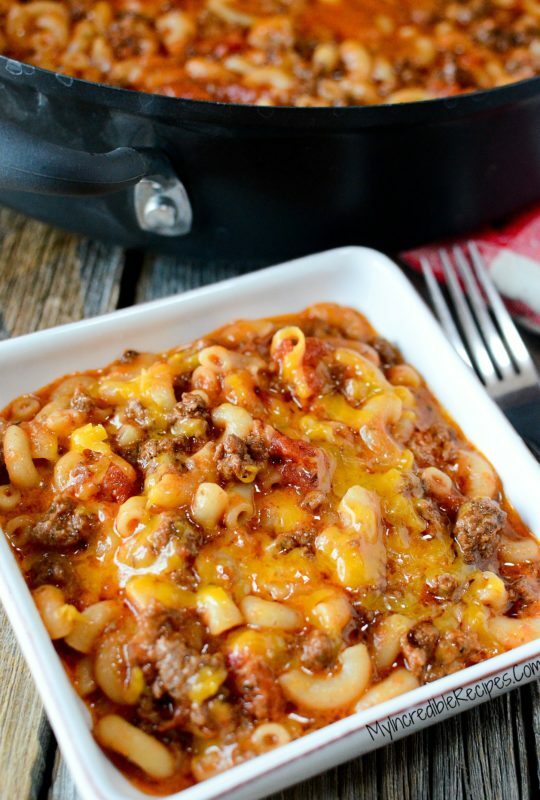 If your family likes Hamburger Helper, they'll adore this. The sauce has a delightful flavor that is perfectly offset by the cheese and enough is going on in here to fill everyone up for the night. Make it a bit healthier by serving it with sliced veggies or a salad. You're going to love it! You can't call it camping until you've enjoyed some gooey S'mores. Are you with me? But making S'more the old fashioned way is messy and sticky. And unless you have a shower handy, that means going to bed covered in chocolate and marshmallows. No thank you. The Dutch Oven to the rescue! 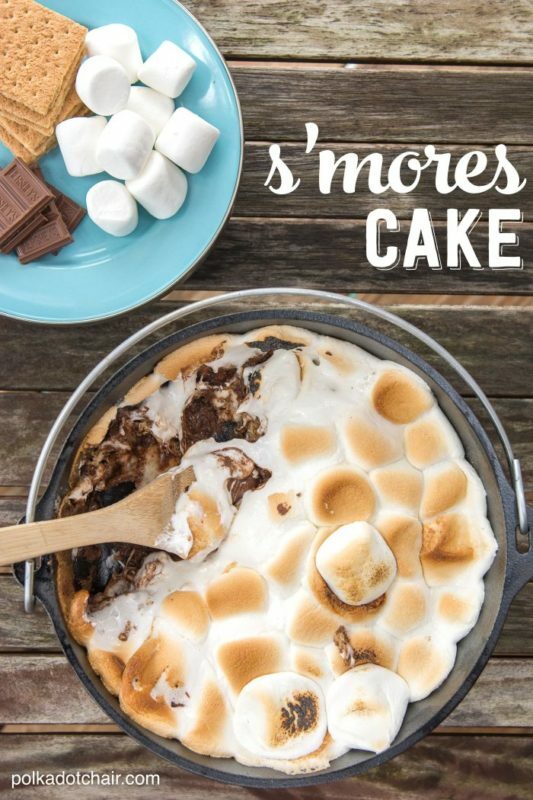 This S'mores cake is just as good as the real thing and is so much easier to eat. Just scoop it straight from the pan with graham crackers as you sit around the fire telling ghost stories. Everyone's going to bed happy tonight! These Sausages Cooked in Beer are going to quickly become one of everyone's favorite Dutch Oven camping recipes. Why? Because they're easy, and they taste really good. You don't have to resign yourself to bland, tasteless hot dogs just because you're camping. 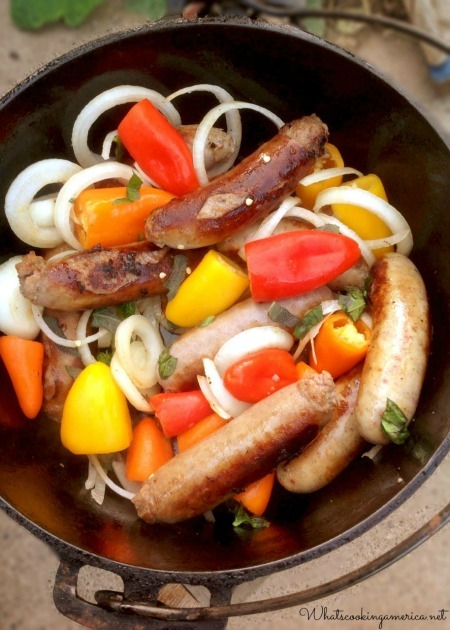 The beer lends a nice taste to the sausages, and the peppers and onions turn it into a full meal. I love to make this after a full day of hiking, but it makes a great lunch option too. I usually serve it with chips because they don't need to be cooked. 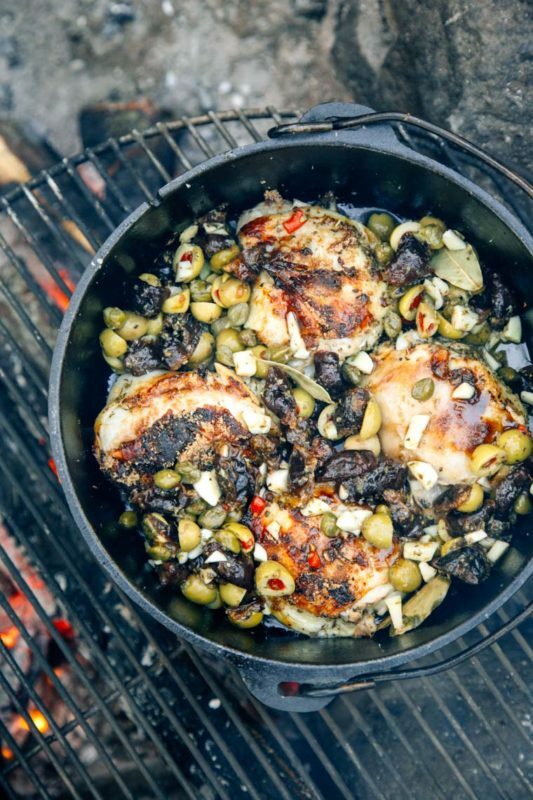 Dutch Oven Chicken Marbella proves how delicious camping food can be. 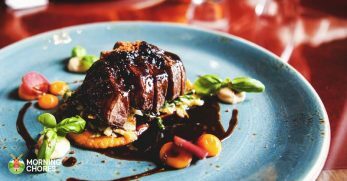 Yes, you can enjoy gourmet meals cooked over the campfire, and this shows it. 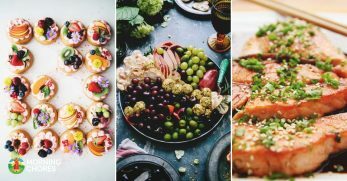 I never turn down olives of any color, which is why this recipe almost always makes my camping rotation. You'll love the flavor, but you'll also enjoy how easy this is to prepare. 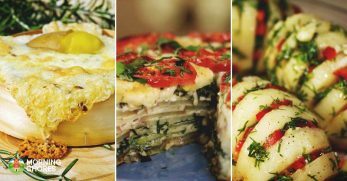 Serve it with egg noodles that you've made at home or with baked potatoes cooked over the coals. 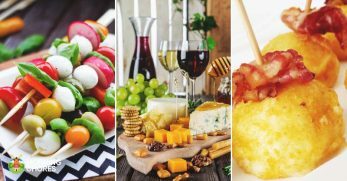 If you want to turn your camping trip into a glamping trip, don't forget to bring some white wine to enjoy with this meal. 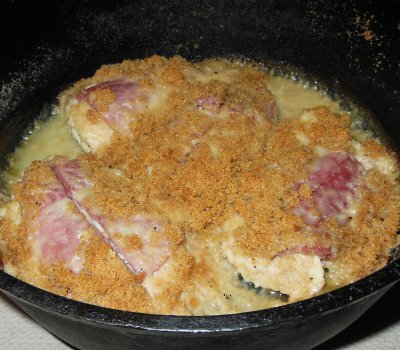 This Chicken Cordon Bleu is fast, easy and will make everyone happy. It's great because you eat it as is, but you can also pile it on bread for a sandwich. The sauce keeps the chicken moist and is like gravy so if you have the means to make mashed potatoes, by all means, go for it. I think what makes this so wonderful is that no one expects to be able to eat a meal like this when the only way to prepare it is over a campfire. So it's amusing to surprise the crowd when you open the Dutch Oven and invite everyone to dig in. Enjoy this creamy Corn Casserole as a filing and crowd-pleasing meal or serve it as a side dish. Either way, you're going to impress yourself with how great this tastes. If you want to make it a meal, throw in some sliced hot dogs or beans and cook it the same way. I think we can all agree that leftovers are lovely when you're camping because they don't take all the time and effort to prepare. This dish always leaves something for tomorrow and tastes good hot or cold, so you have plenty of options. You won't even feel like you're camping when you make these Honey Barbecue Wings in your Dutch Oven. 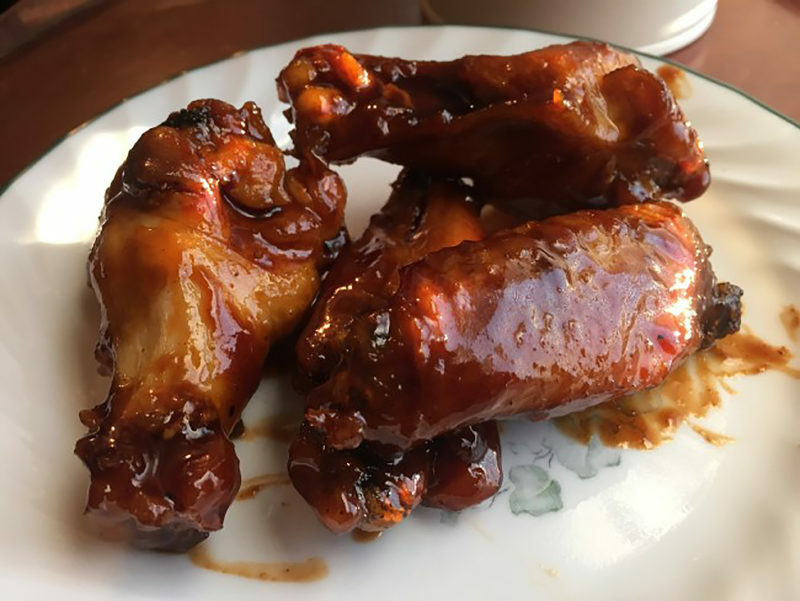 My kids love hot wings anytime, anywhere so I made it my mission to ensure that I could make them in a Dutch Oven. Thankfully this recipe came along. The sauce is delightfully sticky and delicious so be sure you have a lot of wet wipes on hand. Make it iconic by serving these with celery sticks and blue cheese or ranch dressing. It makes my kids happy, and I bet it will make yours happy too. The kids are going to be so happy when they find out they can have Macaroni and Cheese even while you're camping. And you're going to love that this isn't the kind that comes out of a box. 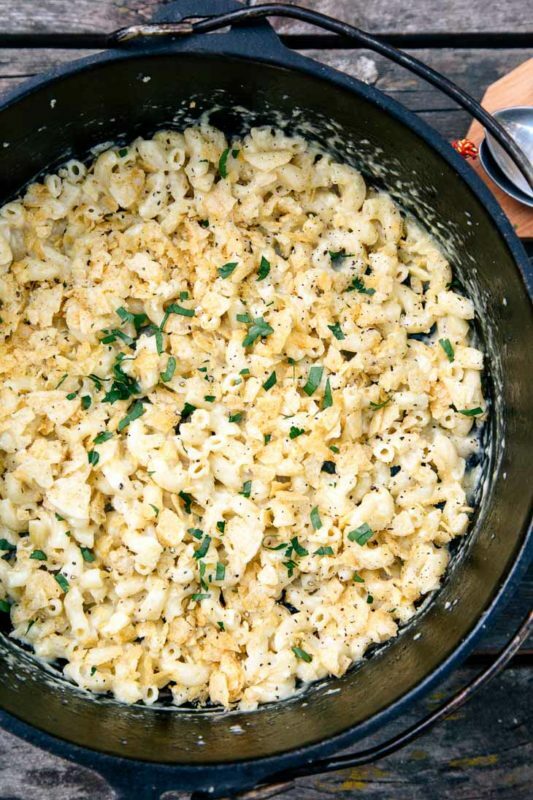 Make it fun by using spiral or shell noodles and mixing and matching the types of cheese you use. 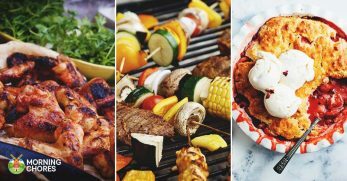 This meal is one of my go-to choices for lunch around the campfire, and I usually serve it with a fruit of some type. A couple of bowls of this and my kids are ready to get back to digging in the dirt and hunting for deer bones. So do yourself a favor and add this to your list. 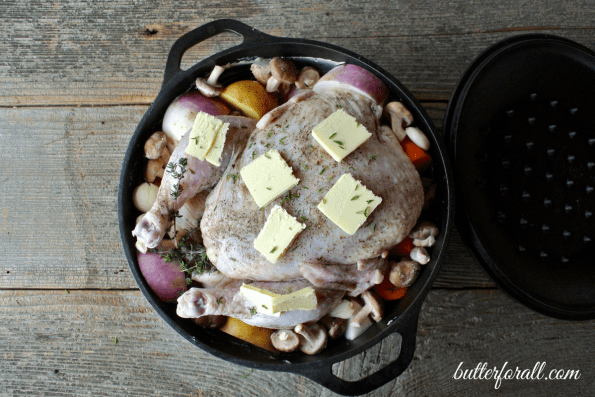 As Dutch Oven camping recipes go, this Whole Chicken is perfect – it's a complete meal in one pot, it's yummy, and it's super easy to clean up. What more could you ask for? I love how the butter and herbs jazz up the meal and turn it into a little bit of glam in the great outdoors. And of course, I love potatoes, so that's another win for this dish. Add some bell peppers, broccoli or green beans to the pot to round things out. I also like to serve bread and butter with this meal. No one will want to stay in their sleeping bags when this delicious French Toast is served. 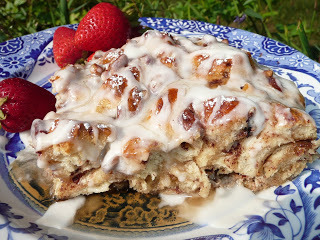 It's full of cinnamon, and the gooey frosting makes it really stand out. You won't even need any syrup because there's enough sweetness without it. Fresh strawberries are ideal with this, but any fruit will do. I tend to serve this on our first morning because nothing tastes better on the side than a glass of milk, which will stay cold in the cooler for just a day or two. And you can use gluten free bread if you so desire. Perfect! 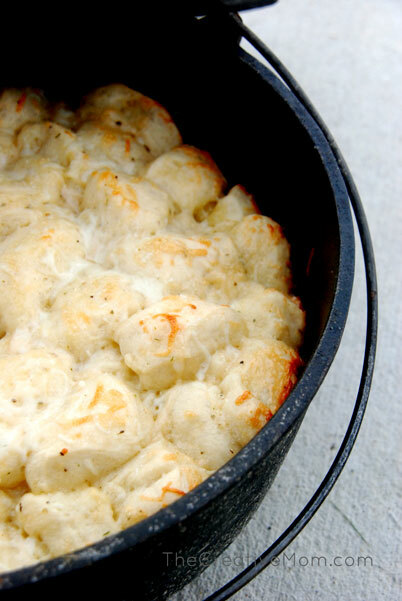 Dutch Oven Bread is great for serving with meals, but it also tastes pretty great on its own. My kids love to snack on this while they run around the woods. It's fine plain, but is really wonderful slathered with butter. I make a couple of loaves right away and store them for eating with the rest of the trip. 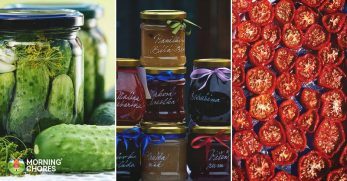 You can toast this over the fire and serve it with eggs for breakfast or slice it and serve it alongside the chili, goulash or pot roast mentioned above. Really, you can't go wrong with bread so eat it however you see fit. 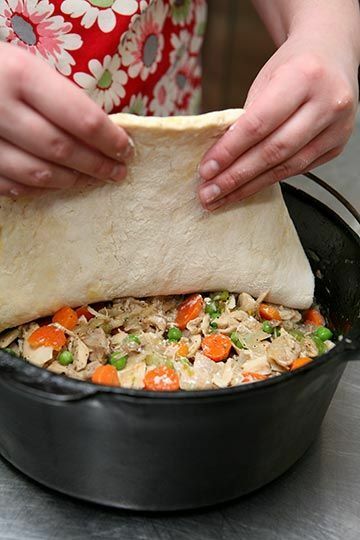 Making Chicken Pot Pie in the Dutch Oven results in a meal you won't want to stop eating. And I love it because it's so easy and so tasty. As you can probably tell, I love one pot meals and this is one of the best. It has vegetables and meat so it's a complete meal that you can spoon right from the pot to the plate. I was so excited when I found this recipe because chicken pot pie is such a comfort food and it's great for warming bellies on a cool night. And as you know, the temps can drop fast in the mountains, so it really pays to have something to keep you warm until the sun comes back up. 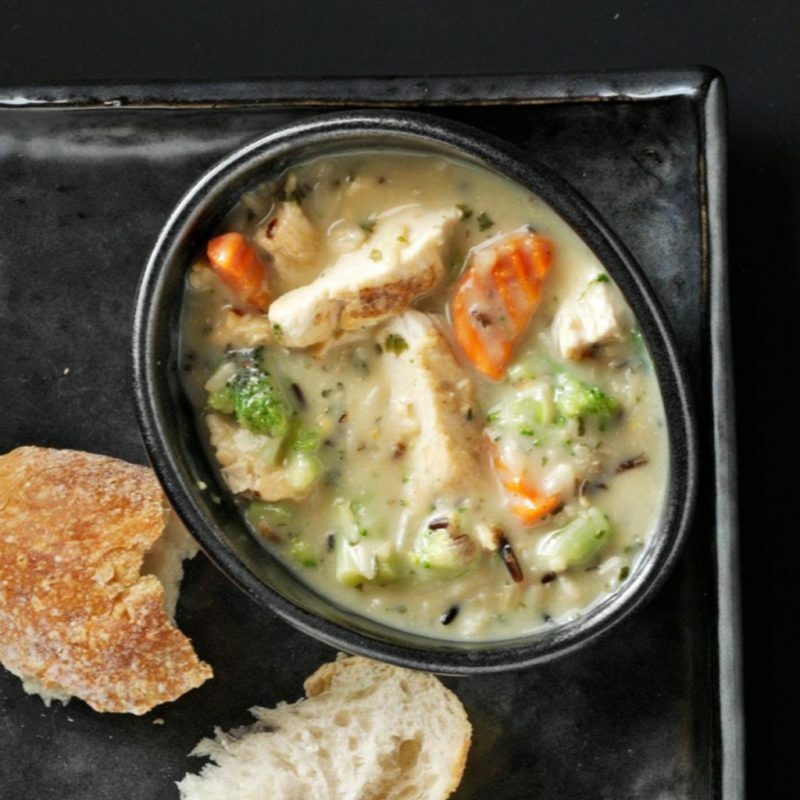 Speaking of dropping temps, this Dutch Oven Chicken and Wild Rice Soup is the perfect meal for a cool night at the campsite. 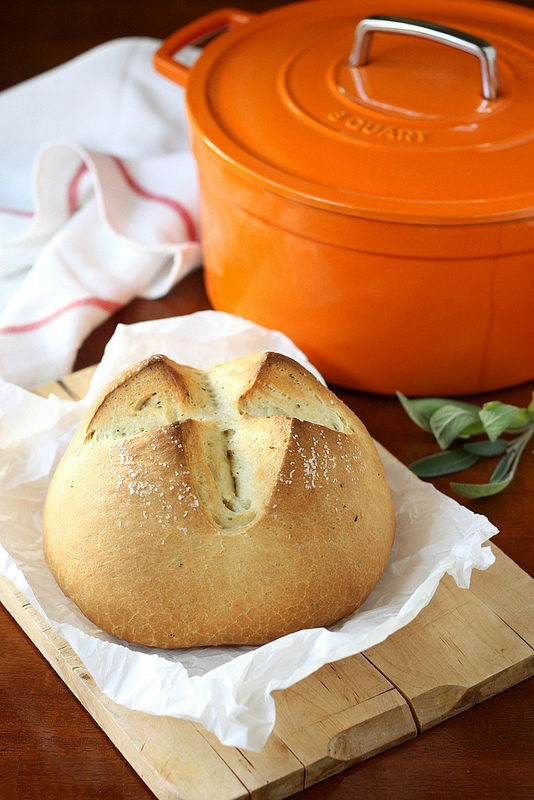 Serve it with the rustic bread you made earlier. To me, there's nothing better than sitting around a campfire with my family enjoying a warm crock of soup and getting away from it all. If you don't love wild rice, try this with pasta, orzo or plain white rice. It may change the flavor a bit, but will still warm you from the inside out. No matter what, you're going to love it! 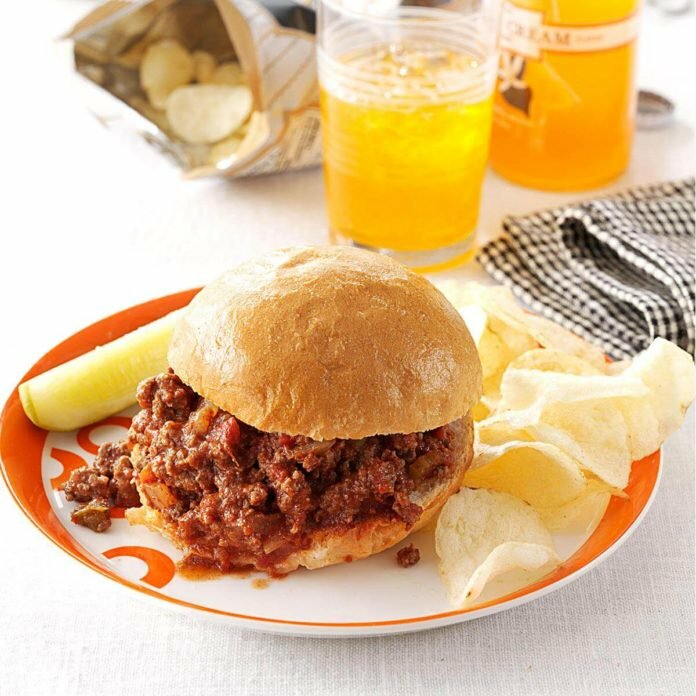 Serve these Sloppy Joes with potato chips and fruit for a delicious meal beside the campfire. In fact, this is one of my favorite things to make for lunch when we're camping. Everyone loves sloppy joes and they're so easy. And the filing can double as taco meat on another night. 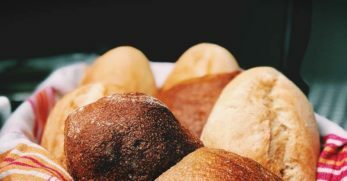 Rolls work well for this, but plain old bread works great too. I also think you can really turn this into a standout meal by offering sliced veggies. Make extra because people are going to love this! 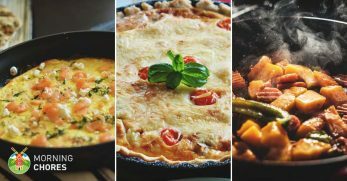 There you go – a delightful selection of Dutch Oven camping recipes to tickle everyone's taste buds. Who knew you could enjoy such a wide selection of great meals at the sampsite. No more cold cuts and apples at every meal! That may be just what it takes to turn a camping hater into a camping lover. I'm so excited about Dutch Oven cooking right now that I'm off to plan my next camping trip. The only problem will be just which recipe to make first. What do you think it should be?